January 28, 2019, Charlottetown – Four members of P.E.I.’s Canada Games short track speed skating team found success in Chicoutimi, Q.C., recently, in one of their final tune-up events before February’s Canada Winter Games in Red Deer, A.B..
Andrew Binns set a new P.E.I. record for junior men in Chicoutimi, Q.C.. Photo courtesy of Kristen Binns. Andrew Binns led the Island contingent, with a 5th place overall finish in Group 2 of the Quebec Provincial circuit meet. 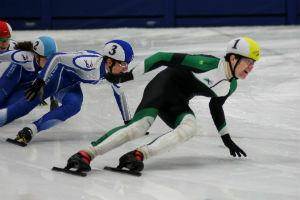 Binns was propelled by a 4th place finish in the 1000 metre event, where he set a new provincial record for junior men, edging Scott Beamish’s 10 year-old mark. Kyle Connell of Charlottetown placed 8th overall in Group 2, after a strong opening day where he set a new personal best (“PB”) time in the 500 metre distance, clocking in at 45.7 seconds. With his new PB, Connell also met the qualifying standard time for the Canadian Junior Selections competition to be held in March in Sherbrooke. William Lyons of Rock Barra continued his successful season with a pair of personal bests in the 500m and 1000m distances, enroute to 10th place in Group 2. Thomas McQuaid of Charlottetown posted a large PB time and a win in the 1500 metre event, placing 8th overall in Group 3. Island skaters will be back in action this weekend on a pair of fronts. Peter McQuaid and Jenna Larter will be competing at the Canadian Open National Qualifier event in Montreal starting on Friday, while nearly twenty Island skaters will take to the ice for the Atlantic Canadian Short Track Championships in Dieppe. For full meet results, visit www.speedskatepei.com.